Like a child who has mastered a new game, Miss Lemon has now officially gotten the hang of 'Forgotten Book Friday.' 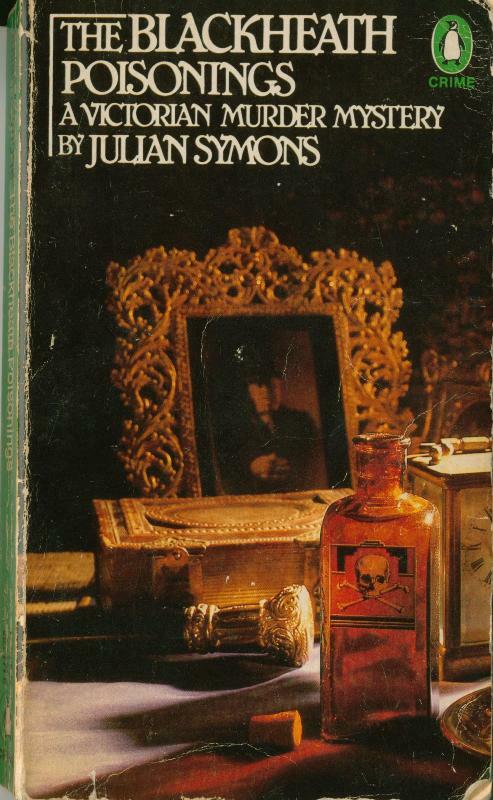 If she seems to be able to think of nothing else for her blog, please accept her sincerest apologies as she offers this week's selection: The Blackheath Poisonings (1978), by Julian Symons. In a word, it's unputdownable. All right. That may be more than one word squashed together, but you see Miss Lemon's point. Subtitled 'A Victorian Murder Mystery,' Mr. Symons delivers what he promises. The prose is so polished, the dialogue so convincing, the plot so positively Victorian in its intricacies and double meanings, that Miss Lemon had to double-check Mr. Symons's vital statistics to be sure that he was not a product of the Victorian era. Born in 1912 and deceased in 1994, he is not. A lifelong poet and novelist (Mr. Symons left school at age 14), he succeeded Agatha Christie as president of England's Detection Club in 1976, holding the post for almost a decade. The Blackheath Poisonings is an excellent example of the Golden-Age influence on Mr. Symons. The story centers on the last twisted branches of the Mortimer family tree. The descendants have set up their strange houses in Blackheath, then a bucolic retreat some short distance from London. When Roger Vandervent, husband of docile Beatrice, dies suddenly of 'gastric fever,' his son Paul suspects something foul. It's not long before a cache of incriminating letters are discovered in the hands of a blackmailing servant. Miss Lemon trusts she's not giving too much away when she says that more than one death and a sensational trial follow. (If Mr. Symons was not a Victorian, he most certainly must have been a barrister.) And through all of this winds the thread that Paul Vandervent grasps much too late: "Somerset Maugham [Paul writes] says somewhere that Victorians felt about women as though they had no back passages." They had no complexity; no strength or integrity. But those Victorians got it very wrong. Mr. Symons, however, gets it -- and this engaging crime story -- very right. Yes, do! Miss Lemon begs you to relent. She promises you won't be sorry. I must admit Miss Lemon's appeal to relent and allow mysteries into one's reading life before old age has some merit, given the convincing nature of her latest posts. I've never read any of Symon's books. Maybe I'll start with this one. Sounds perfect for the sort of mood I'm in lately. For whatever reason I've been going back and reading a few authors I skipped the first time around. Fun. I must read this book. The adaption that was made for TV was very enjoyable and am very excited to know it is available in book form!